I hardly had heard of Upper Volta before coming to Africa. I couldn’t even pronounce its capital’s name — Ouagadougou. But now its name, its land, the tribes and its culture are more familiar to me after passing 10 days there. Upper Volta is as big as Colorado, but, unfortunately far less endowed in natural resources. 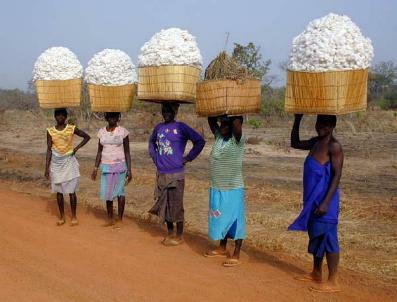 According to the latest United Nations statistics, Upper Volta ranks as the world’s fourth poorest country. The average yearly income is $78. There are about 20 different ethnic, groups in Upper Volta, with the Mossi being the predominant tribe. In other parts of Africa, I had seen facial scars, but never so elaborate as the Voltaig’s marks. Some of their scars were full circles around their face as if to frame their features. The Voltaig cheek scars penetrate deeply into their skin. On first sight, Upper Volta looks like a nation of battle-scarred gangsters. Behind these abused faces lie characters as tame as their herds of baby lambs. The Voltaigs are always smiling and extending their hands in some of the firmest handshakes I’ve ever received. My first stop was at Upper Volta’s economic center, a funny sounding town called Bobo Dioulasso. I hated arriving in a new town at night and cursed the chauffeur. It had taken exactly 24 hours to go only 300 kilometers. If he wasn’t making a Muslim prayer stop, then he’d stop just to rest for several hours. Passengers had no choice but to hang loose, too. Before I could even orientate myself in Bobo, an African couple approached me and invited me into their home. As a matter of fact, I enjoy staying with families and experiencing their home life first hand, but the disadvantage is that I tend to be the numero uno focus of attention. Staying with Issaka and Tata in Bobo was a classic case in point. I was excited because it was the first time I got to sleep in a genuine African hut. It was circular with a dirt floor and only a hard bamboo bed in the room. The ceiling rose to a point and gourds were hanging on the walls, not as decoration, but as kitchen utensils. Within five minutes of my arrival the entire neighborhood knew a white was staying nearby. When I sat outside, an audience of at least 30 persons, mostly children, encircled me. I continued carrying on a conversation with Issaka and Tata, but could not help feeling self conscious of all my actions. I only spent one night with the family because I didn’t have a visa for Upper Volta. So I had to rush to the capital to legitimize my presence in the country. I was unable to get an Upper Volta visa in Mali, because last year there was a border skirmish resulting in the two countries breaking off diplomatic relations. Ouagadougou is a clean little city with broad treelined boulevards in typical French fashion. One of the main streets is called Charles DeGaulle Avenue. Perhaps the streets just looked so wide because most of the vehicles were small French mopeds. Mopeds are a pollution-free cross between a bicycle and a motorcycle. One gets about 250 miles to the gallon, which is ideal in this fuel deficient era. Upper Volta is experiencing a Third World version of energy shortage. People can’t afford oil or ovens, so they cook over a log fire. The major problem is that for 70 miles around Ouagadougou the brush has been depleted of wood causing their simple fuel sources to skyrocket in cost. The Voltaigs really like Americans. I attribute this to America’s Peace Corps program. They admire our young American kids who serve two years in the villages helping build wells or plotting gardens. I met Tia, a volunteer from New York, who had just signed up for a third year in Upper Volta. Tia was a great guide for me in Ouagadougou’s market. Normally, I’ll walk around the stalls and not have the slightest idea what all the strange products are, but she was familiar with most of them. One unusual discovery we made was a “kirou touko.” This is a small fur-covered goatskin container that looks like a bobber for a fishing line. It cost 30 cents and was filled with “kirou” for another 20 cents. Kirou means dust and is a gray powder used as mascara. For another 10 cents we bought the nail that fits inside and is used for applying the makeup. Ouagadougou, has several typical African characteristics, such as the tables set up in front of the post offices. A man sits behind the little desk, selling his writing skills. An uneducated native will sit down and dictate a letter he wants sent. Like a secretary, the writer writes all his customer’s words in first person. One African service I regularly make use of is the street side coffee stands. For about a quarter you get a big cup of coffee inundated with cream and a big piece of long French bread, hot and dripping with butter! These stands still operate between noon and 3 p.m., siesta hours in Ouagadougou when most stores close. Another typical African delight is the peanut butter, sold in the markets. Peanuts are a big crop in the Sahel countries, so fresh organic peanut butter is a natural result. It sits like thick soup in big bowls and the women scoop out portions for you. • Chunky peanut butter is not available. • People think you’re weird if you spread peanut butter on bread. They use it as a sauce in cooking, but never in a sandwich. When I left Ouagadougou, Tia gave me a ride on her moped out to the police station. All cities and towns in the African countries I’ve been to have barricades at the city’s limits. One must present identification, state your destination and reason for traveling, and, far too often, you’re subjected to searches. If you’re friendly with the guards, they tend to loosen up and not act as tough as they pretend to be. I turned on all my charm and they flagged down a ride for me. It was easier than hitchhiking. There’s nothing overly special about Upper Volta. It’s a very calm, easy going, typical African country where everyone seems content. It’s not as fabulous as the cultures I saw in Mali, yet Upper Volta, simply because it is an African country, was still a worthwhile place to visit in getting to know this titanic continent.